Once more, we have tasted salt. We have mourned our dead from the earthquake and the cholera epidemic. The collective depression, the temporary zombification has lifted. It is time to evict the occupier and pursue the traitors and enemies of our independence. No exception. 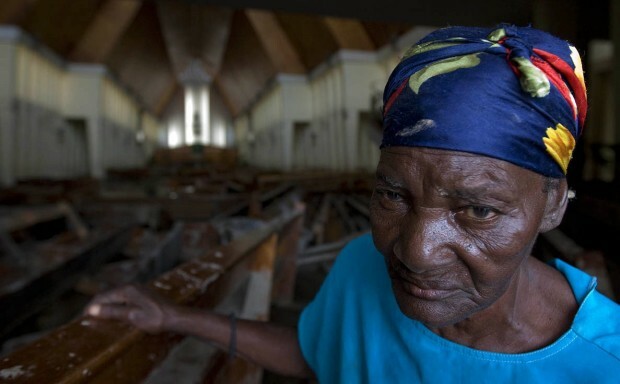 This is not the first time the United States has occupied Haiti and been evicted from it. The first occupation began during the administration of the questionable Nobel Peace Prize laureate President Woodrow Wilson in 1915. It was countered by an armed insurrection that grew to include over 40,000 Haitian fighters who regularly engaged the US marines. Although this insurrection was ultimately crushed, it was followed by numerous popular strikes in Haiti as well as calls in the US by women’s groups and Black Americans to end the occupation. The return to sovereignty was relatively simple: a committee was assembled to organize legislative and presidential elections. The occupation formally ended in 1934, near the start of the presidency of Franklin Delano Roosevelt, who personally came for a flag-raising ceremony in Haiti to recognize its independence. Back in 1915, the Monroe Doctrine needed no cover of legitimacy or humanitarianism. The cowardly Sudre Dartiguenave was picked as Haiti’s President while US marines waited with bayonets at the ready for the correct choice to be made by the legislature. Two years later, the legislature was dissolved outright by Major General Smedley Butler when the Haitian parliament refused to ratify a US-drafted constitution. A treaty was forced on Haiti that created the post of US High Commissioner, to run the country alongside its hand-picked “Haitian” president. General John H. Russell was appointed to that post. The US flag was raised in Haiti. Control of the country’s finances, public works, and public health services were transferred to southern US Democrats who had supported Wilson’s campaign, in much the same way that these are transferred today to USAID and non-governmental organizations (NGO). The idea then was the same as now: all Haiti’s economy should serve the US, and nearly all US dollars paid as wages in Haiti should return to the US. For more than three decades, the occupier also collected taxes from Haitians that amounted to 40 percent of the gross domestic product (GDP). Clinton saw in the earthquake of 2010 his opportunity to become the new US High Commissioner of Haiti. Hardly anything in his approach was novel, except for his recruitment of Latin Americans to support his project. Argentina, Brazil and Chile were offered the chance to get prestige on the world scene and assemble a repressive force away from the prying eyes of their nationals by training and modernizing their armies on Haitians as their unsuspecting victims. Thus these countries became the ABC core of the United Nations (de)Stabilization Mission in Haiti (MINUSTAH): the only so-called UN peacekeeping force in a country that is not at war. 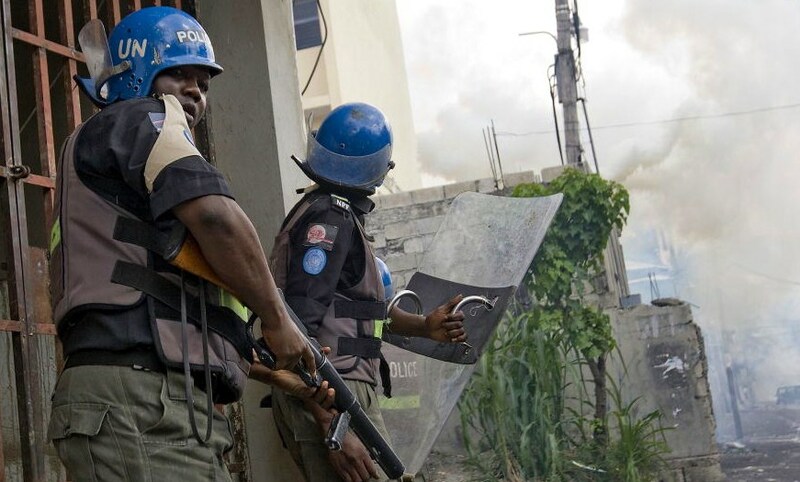 MINUSTAH began its career by killing thousands of Lavalas partisans so as to suppress the popular rebellion against the coup that removed Haiti’s elected president, Jean Bertrand Aristide. 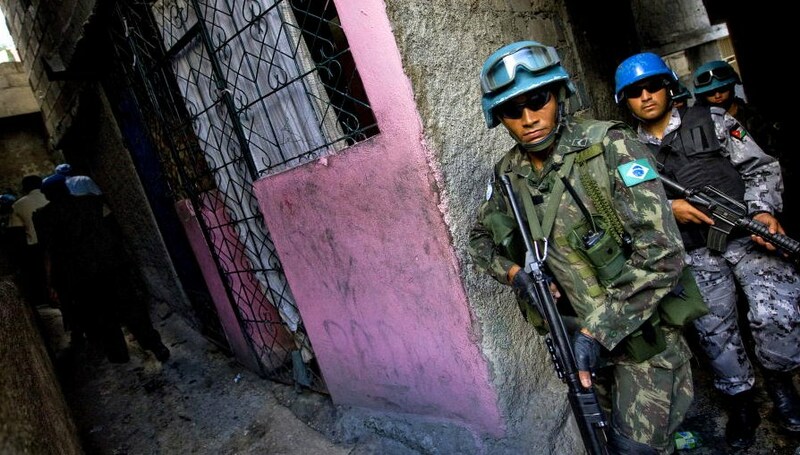 Currently Bolivia, Canada, Ecuador, El Salvador, France, Guatemala, Honduras, Indonesia, Jordan, Nepal, Paraguay, Peru, Philippines, the Republic of Korea, Sri Lanka, the United States and Uruguay also participate in an expanded MINUSTAH. Once Clinton’s repressive army was in place, he set out to wrest economic control of Haiti. Within four months of the earthquake, he formed the Interim Haiti Recovery Commission, IHRC: a strictly pay-to-play group of officials/rich businessmen from the MINUSTAH countries and others who agreed to contribute armed personnel from their countries or money (at least $100 million in a two-year period, or erasure of over $200 million in debt) in return for a piece of the action in Haiti. After some arm twisting and alleged bribery, the Haitian parliament was forced to declare a state of emergency for 18 months during which Clinton and his IHRC gang could do as they pleased with regard to reconstruction, without risk of liability. One year and a half came and went, and when the Haitian Senate observed that nothing much had been accomplished, the state of emergency was not renewed, and the IHRC was alleged to be fraudulent. By then, Clinton and his cronies had begun to search for another way to continue their economic stranglehold on the country, and this would include a suitable Haitian President: specifically, one who would be popular with the young but lack patriotism. They found their man in the vulgar musician Michel Martelly. His election became a mere formality after an electoral commission excluded from participation the Fanmi Lavalas party, which commanded 80 percent of the electorate. Observers from Caricom and the Organization of American States (OAS) legitimized the results despite countless irregularities and ballots from only about 20 percent of the electorate. Such are the conditions under which Michel Martelly was (s)elected President of Haiti. Simultaneously with the assembly of the new parliament in Spring 2011, Clinton tried to push on Haiti a series of constitutional amendments, nearly all of which aimed to centralize the government so that the country would be more easily controlled via its executive branch. In particular, the Haitian Supreme Court, normally appointed with the input of communal assemblies, would be replaced by a Constitutional Council of Martelly appointees. All local judges, mayors, and departmental governors would also be replaced by Martelly appointees. Finally, the president would be allowed to serve consecutive terms instead of being limited to non-consecutive ones of five years. After the parliament refused to ratify those changes, it was not dissolved. Such things are no longer done in this era of humanitarian imperialism. The constitutional amendments were simply imposed on the country by presidential decree, and the parliament was allowed to atrophy from a neglect to hold legislative elections. Clinton picked Laurent Lamothe as Haiti’s Prime Minister. He did not have to look far: Lamothe was a rich businessman and IHRC member. Haiti is not exceptional in having men like Martelly or Lamothe who would eagerly serve as the Vichy administration to an occupier. It is hardly surprising that the first allegiance of such individuals is to money. Soon after the installment of the Martelly-Lamothe regime, the electrical grid and running water services began to be dismantled in Haiti’s major cities. This had the effect of depressing land prices in areas coveted by government officials as well as creating a reason to solicit aid funds. Worse, Martelly appointees – some with criminal records – began to ransack and even destroy Haiti’s city halls and local courts. 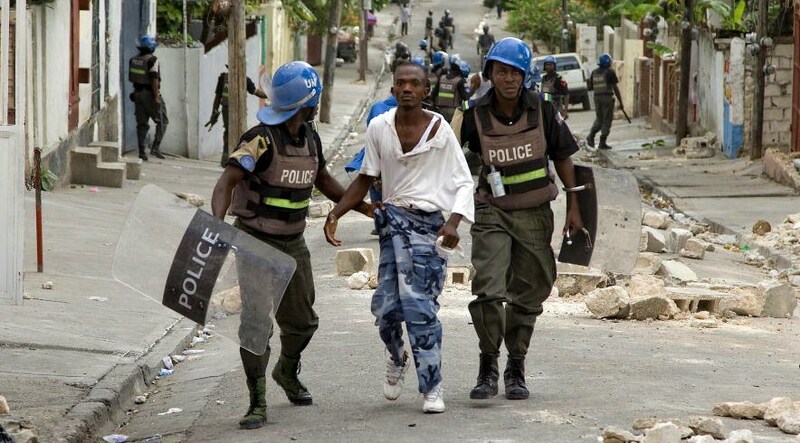 Peaceful protests against these insults met with violent attacks, initially from MINUSTAH and later, from a rapidly growing and increasingly militarized Haitian police force. Yet more egregious recent actions by the Martelly-Lamothe regime have included: the appropriation of Haiti’s offshore islands by the tourism ministry by decree, followed by the imprisonment and suspicious death of activists who had opposed the land grabs; an agreement to grant the collection of Haiti’s customs taxes to a private Swiss company for 10 years, without discussion with the parliament; the acceptance of reparation funds from Uruguay by the executive branch, also without consultation with the parliament; the suspicious death of a judge who had been investigating a case of usurpation and money laundering brought against the president’s wife and son. There was never an inquest; the plaintiffs in the case, Enold and Josue Florestal, have been incarcerated since August 2013 in what are generally regarded as being politically motivated imprisonments. 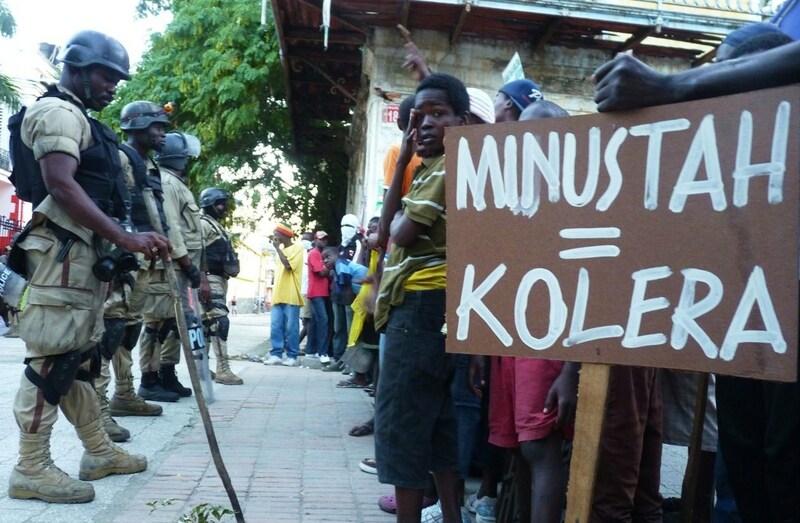 Protests throughout Haiti have reached fever pitch. 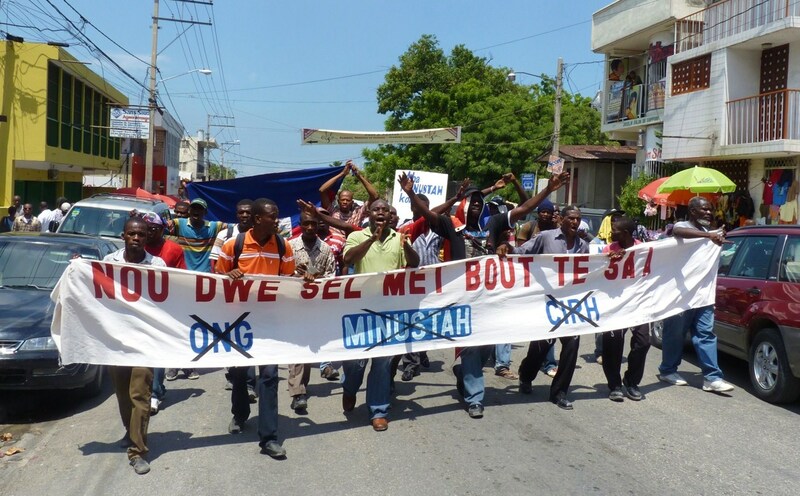 Some municipalities, like Petit Goave and Port-au-Prince have held over 20 days of actions to express their disgust with the incompetent and corrupt occupation regime. Despite public support from Bill Clinton, his protégé Laurent Lamothe was forced to resign his post as Prime Minister on December 13, 2014. Michel Martelly, who is also supported by Bill and Hillary Clinton, will probably go the same way. The international community, which had been content to parasitize Haiti in its worst moment, recently began to cry that the country is entering a crisis, because the failure to hold elections will cause the dissolution of the parliament on the second Monday of January 2015. Coincidentally, Monday, January 12, 2015 will also be the fifth anniversary of the earthquake: a day for stocktaking, for sure. Clinton’s paltry achievements in reconstruction will not fare well. Haiti is not entering a crisis, it is emerging from one. If the international community wishes to conduct legitimate business with Haiti, then Clinton’s damages must first be mended. Elections must be held at the earliest possible date for all local officials (mayors, judges), the legislature, and a new president. A prime minister must be appointed, and a supreme court must be seated. With regard to Haiti, the expressions constitutional crisis and political chaos from the international community have usually been threats to declare a failed state and propose governance by the UN or receivership by the US. Such threats are hardly worth anyone’s notice. It is quite unwise for the UN and US to presume that they would fare better than Napoleon in an attempt to take Haiti by force. There is no other choice for the Clintons but to leave Haiti, together with their international cohort of parasites, including MINUSTAH, the NGOs and USAID. If Bill Clinton has peddled to his rich friends parts of Haiti that never belonged to him, then let this be his personal quandary. A series of legal actions relating to embezzlement, corruption and money laundering are already being taken against Martelly’s family and Lamothe; Clinton might well get caught in the same net. Contracts entered into during the period of runaway larceny by the Clinton-appointed Martelly-Lamothe regime deserve no more respect than the purchase of one’s stolen watch on a street corner. 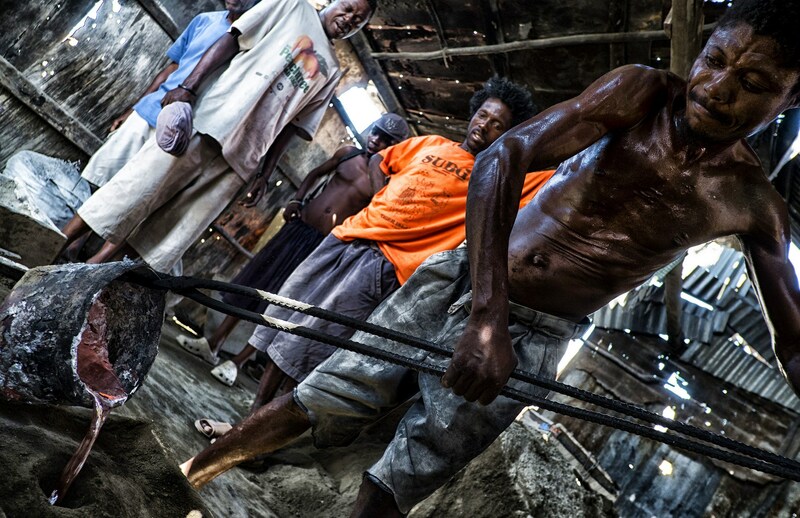 Haiti is not for sale: not in bulk, not in retail. Editor’s Notes: Dady Chery is the author of We Have Dared to be Free. This article is also available in French and German. Photographs one, eight, nine, eleven, twelve, and thirteen from UN Photo archive; photographs three, five, seven and ten from the archive of Ansel; photograph six from the archive of UN Development Program. UPDATE 1. After more than a year in prison, the political prisoners Enold and Josue Florestal, were released to the Haitian human rights group Réseau National pour la Défense des Droits Humains (RNDDH), and to their families, during the afternoon of Friday, December 19, 2014. Une fois de plus, nous avons goûté au sel. Nous avons pleuré pour nos morts du tremblement de terre et du choléra. La dépression collective, la zombification temporaire s’est dissippée. Il est maintenant temps d’expulser les occupants et de poursuivre les traîtres et ennemis de notre indépendance. Aucune exception. Ce n’est pas la première fois que les États-Unis d’Amérique ont occupé Haïti et en ont été expulsé. La première occupation avait commencé lors de l’administration du laureat douteux du prix Nobel de la paix, à savoir, le président Woodrow Wilson, en 1915. L’Occupation avait été mise en cause par une armée d’insurrection qui avait grandi jusqu’à plus de 40 000 rebels haïtiens qui se battaient régulièrement avec les Marines américains. Malgré que cette insurrection fut écrasée, elle avait été suivie par de nombreuses grèves en Haïti ainsi que des appels aux États-Unis, par des groupes de femmes et d’américains-noirs, pour mettre fin à l’occupation. Le retour à la souveraineté était relativement simple: une commission s’était réunie pour organiser des élections législatives et présidentielles. L’occupation s’etait officiellement conclue en 1934, au tout début de la présidence de Franklin Delano Roosevelt, qui etait venu personnellement participer à une cérémonie où le drapeau haïtien avait été finalement hissé pour reconnaître l’indépendance du pays. En 1915, la doctrine de Monroe n’avait pas besoin d’une couverture de légitimité ou d’humanisme. Un homme lâche, en l’occurence, Sudre Dartiguenave, fut choisi comme président d’Haïti pendant que des Marines américains, baïonnettes à la main, attendaient ce choix des législateurs. Deux ans plus tard, lorsque le parlement haïtien refusa de ratifier une constitution rédigée par des américains, la législature fut dissoute, sans formalité, par le général américain, Smedley Butler. Un traité forcé sur Haïti créa ainsi le poste de Haut Commissaire des États-Unis pour gérer le pays aux côtés d’un président «Haïtien» fantoche. Le général John H. Russell fut nommé à ce poste. Le drapeau américain flottait de nouveau en Haïti. Le contrôle des finances du pays, des travaux publics et des services de santé publique furent ainsi transférés aux démocrates américains en provenance du sud qui avaient soutenu la campagne éléctorale de Wilson; aujourd’hui ce role de parasite a été transféré à USAID et des organisations non-gouvernementales (ONG). En tout état de cause, les idées du passé étaient les mêmes que celles de maintenant: l’économie de tout Haïti devrait servir presque exclusivement les États-Unis, l’idée étant que chaque dollar de salaire américain doit revenir aux États-Unis. Pendant plus de trois décennies, l’occupant persevait aussi des impôts haïtiens representant 40 pour cent du produit intérieur brut (PIB). Le tremblement de terre de 2010 donna à Bill Clinton une chance inespérée de devenir le nouveau Haut Commissaire américain d’Haïti. Rien n’est jamais nouveau sous le soleil, apart le recrutement des Latino-Américains pour soutenir son projet. L’Argentine, le Brésil et le Chili ont eu ainsi la possibilité d’accroitre leur prestige sur la scène internationale et de constituer une force repressive, loin des regards indiscrets de leurs concitoyens, en formant et modernisant leurs armées au depend d’haïtiens sans méfiance. Ainsi, ces pays sont devenus le noyau dur «ABC» de la Mission des Nations Unies pour la (de)Stabilisation en Haïti (MINUSTAH): la seule force de «maintien de la paix» de l’ONU dans un pays paisible. La MINUSTAH a commencé sa carrière meurtrière en tuant des milliers de militants de Lavalas pour matter une rébellion populaire contre le coup d’état qui avait renversé du pouvoir le président élu d’Haïti, Jean-Bertrand Aristide. Présentement, la Bolivie, le Canada, l’Équateur, El Salvador, la France, le Guatemala, Honduras, l’Indonésie, la Jordanie, le Népal, le Paraguay, le Pérou, les Philippines, la Corée du Sud, Sri Lanka, l’Uruguay, et bien sûr les États-Unis participent tous à une MINUSTAH élargie. Une fois en place, la structure répressive de Clinton s’est ainsi emparé du contrôle de l’économie haïtienne. Seulement quatre mois après le tremblement de terre, Clinton formait déjà sa Commission Intérimaire pour la Reconstruction d’Haïti (CIRH): un groupe constitué d’officiels et d’hommes d’affaires venant des pays de la MINUSTAH ainsi que d’autres pays: ceux qui avaient accepté de fournir des militaires de leurs pays ou de l’argent (au moins 100 millions de dollars en deux ans, ou la grace de plus de 200 millions de dollars en dette) en échange pour des affaires à Haïti. Après des pots de vin et coercions diverses, le parlement haïtien fut contraint de déclarer un état d’urgence pour 18 mois pendant lequel Clinton et ses acolytes du CIRH pourraient faire à leur guise, à l’égard de la reconstruction, sans risque de responsabilité d’aucune sorte. Après un an et demi, une fois que le sénat haïtien observa que presque rien n’avait été accompli, l’état d’urgence ne fut pas renouvelé, et la CIRH fut accusée d’être frauduleuse. A partir de ce moment, Clinton et compagnie se sont mis à rechercher un autre moyen pour continuer leur mainmise économique sur le pays. Ce fut de choisir un président haïtien approprié: plus précisément, quelqu’un de populaire avec les jeunes mais manquant de patriotisme. Ils ont trouvé l’homme idéal en la personne de Michel Martelly, un musicien vulgaire d’une intelligence médiocre. Son élection devint une simple formalité après qu’une commission électorale ait exclu la participation du parti Fanmi Lavalas, qui aurait probablement obtenu 80 pour cent des votes. Des observateurs de la Caricom et l’Organisation des États Américains (OEA) ont validé les résultats malgré d’innombrables irrégularités et des bulletins de vote representant environ 20 pour cent de l’électorat. Telle était la situation dans laquelle Michel Martelly fut “élu” président d’Haïti. Simultanément avec l’inauguration du nouveau parlement au printemps 2011, Clinton essaya de forcer sur Haïti une série d’amendements constitutionnels, presque tous visant à centraliser le gouvernement afin que le pays soit plus facile à contrôler par l’intermédiaire du pouvoir exécutif. En particulier, la cour suprême haïtienne, en principe nommée avec la participation des assemblées communales, aurait été remplacée par un conseil constitutionnel nommé par Martelly. Tous les juges locaux, les maires et les gouverneurs de départements auraient été également remplacé par des personnes nommées par Martelly. Finalement, le président aurait été autorisé à des mandats consécutifs au lieu d’être limité à deux termes non-consécutifs, chacun de cinq ans. Après que le parlement ait refusé de ratifier ces changements, il n’a pas été dissous. Ces choses ne se font plus dans notre ère d’impérialisme humanitaire. Les amendements constitutionnels furent tout simplement imposés sur le pays par décret présidentiel, et le parlement fut rendu impuissant par le refus d’organiser des élections législatives. Laurent Lamothe fut choisi par Clinton en tant que premier ministre d’Haïti. Il n’a pas eu besoin de chercher trop loin: effectivement Lamothe était un homme d’affaires et également membre de la CIRH. Il n’y a rien d’exceptionel à la situation d’Haiti; des collaborateurs d’occupation comme Martelly et Lamothe sont monnaie courrante. Les français se rappellent sans doute de Pétain et de Vichy. Le collaborateur d’occupation n’a qu’une maîtresse: l’argent. Peu après l’inauguration du régime Martelly-Lamothe, le réseau électrique et les services d’eau courante ont commencé à être démantelé dans les grandes villes d’Haïti. L’effet a été une chute des prix des terrains dans les zones convoitées par les représentants du gouvernement ainsi que la création de toutes pièces d’une raison supplémentaire de solliciter des fonds d’aide étrangère. Encore pire, les personnes nommées par Martelly, certaines ayant même des casiers judiciaires, ont commencé à piller et détruire les mairies et les tribunaux locaux d’Haïti. Les manifestations non-violentes contre ces insultes envers les biens publics et la justice furent attaquées brutallement, d’abord par la MINUSTAH et ensuite par une police nationale haïtienne en pleine expansion et de plus en plus musculaire et militarisée. Parmis les actions récentes les plus scandaleuses et inadmissibles du régime Martelly-Lamothe sont: l’appropriation des îles au large d’Haïti par le ministère du tourisme, par décret, suivie de l’emprisonnement et mort suspecte de militants s’opposant aux vols de terres; un contrat pour donner la collection des impôts de douane d’Haïti à une société suisse privée pendant 10 ans, sans aucune discussion avec le parlement; l’acceptation de fonds de réparation de l’Uruguay par le pouvoir exécutif, également sans consultation avec le parlement; la mort éminemment suspecte d’un juge qui enquêtait sur des cas d’usurpation et de blanchissement d’argent portés à l’encontre de la femme et du fils de Martelly. Il n’y a jamais eu d’enquête; les plaignants dans l’affaire, Enold et Josue Florestal, furent incarcérés en Août 2013. Ils furent libérés le 19 décembre 2014, à cause de la pression populaire. Les manifestations en Haïti ont atteint leur apogée. Certaines municipalités, comme Petit Goâve et Port-au-Prince ont eu pendant plus de 30 jours des actions pour exprimer leur dégoût profond pour un régime incompétent, corrompu et esclave de l’occupation. En dépit du soutien très publique de Bill Clinton, son protégé Laurent Lamothe a été contraint de démissionner de ses fonctions de premier ministre le 13 décembre, 2014. Martelly, qui est également soutenu par Bill et Hillary Clinton, suivra probablement le même chemin. La communauté internationale, qui était contente de parasiter Haïti dans un de ses pires moments, dit maintenant que le pays est en crise de vide politique, dû à l’incapacité d’avoir des elections, ce qui entraînera la dissolution du parlement le deuxième lundi de Janvier. Par une coincidence desastreuse pour les occupants, le lundi 12 Janvier, 2015 sera également le cinquième anniversaire du tremblement de terre: un jour où touts les haitiens font le point. Les réalisations minimes, voir dérisoires, de Clinton et compagnie en matière de reconstruction seront mises sous la loupe. Haïti n’ammorce pas une crise, au contraire, le pays est en train de s’en sortir. Si la communauté internationale a l’intention d’avoir des relations avec Haïti, alors, il faut d’abord réparer le désastre Clinton. Les élections doivent avoir lieu aussi tôt que possible pour tous les fonctionnaires locaux (maires, juges, etc. ), les législateurs et, bien sûr, un nouveau président. Un premier ministre doit être nommé, et une cour suprême doit être mise en place. Dans le cas d’Haïti, les expressions «crise constitutionnelle» et «chaos politique» de la communauté internationale sont généralement des menaces de déclarer un état en décomposition et d’imposer une administration de l’ONU ou sous le tutelage des États-Unis. Ces menaces n’ont aucun poids. Il serait impudent pour l’ONU et les États-Unis de presumer qu’ils se tireraient mieux d’affaire que Napoléon dans une tentative de s’emparer d’Haïti par la force. Le meilleur choix pour Clinton et compagnie est de partir d’Haïti, avec leur cohorte de parasites internationaux. Evidemment cela inclu la MINUSTAH, les ONG et USAID. Si Bill Clinton a génereusement donné des régions d’Haïti qui ne lui appartiennent pas à ses amis riches, laissons le mariner dans son jus. Des enquêtes à propos des détournements de fonds, de la corruption et du blanchissement d’argent ont déjà commencé dans des tribunaux d’Haiti contre Lamothe, Martelly et leurs acolytes. Clinton pourrait être le plus gros poisson dans le même filet. Les contrats conclus pendant la période mafieuse du régime Martelly-Lamothe, nommé et employé par Clinton, méritent autant de respect que l’achat d’une marchandise volée dans un coin de rue. Haïti n’est pas à vendre: ni en gros, ni au détail. Sources: Haiti Chery | News Junkie Post (anglais) . Einmal mehr haben wir Salz geleckt. Wir haben unsere Toten aus dem Erdbeben und der Cholera-Epidemie betrauert. Die kollektive Depression und die vorübergehende Zombifizierung ist verflogen. Es ist Zeit, die Besatzer zu vertreiben und die Verräter und Feinde unserer Unabhängigkeit zu verfolgen. Ohne Ausnahme. Es ist dies nicht das erste Mal, dass die Vereinigten Staaten Haiti besetzt haben und von hier vertrieben wurden. Die erste Besetzung begann während der Regierung des fragwürdigen Friedensnobelpreisträgers Präsident Woodrow Wilson im Jahr 1915. Immer wieder brennen bei Protesten gegen die Regierung ReifenDieser Besetzung wurde entgegengewirkt, durch einen bewaffneten Aufstand, der auf über 40.000 haitianische Kämpfer anwuchs, die die US-Marines regelrecht bekämpften. Obwohl dieser Aufstand schließlich zerschlagen wurde, wurde er von zahlreichen Volksprotesten in Haiti, sowie Anrufen von Frauengruppen und schwarzen Amerikanern in den USA gefolgt, um die Besatzung zu beenden. Die Rückkehr zur Souveränität war relativ einfach: ein Komitee wurde zusammengestellt, um Parlaments- und Präsidentschaftswahlen zu organisieren. Die Besetzung endete offiziell im Jahre 1934, vor dem Beginn der Präsidentschaft von Franklin Delano Roosevelt, der persönlich zu einem Fahnenzeremoniell in Haiti kam , um seine Unabhängigkeit anzuerkennen. Praesident Martelly – Ex US Hochkommissar fuer Haiti Bill ClintomSchon im Jahr 1915, benötigte die Monroe-Doktrin keinen Schutz der Legitimität oder Humanität. Der feige Sudre Dartiguenave wurde als Haitis Präsident ausgewählt, während US-Marines mit Bajonetten im Anschlag auf die richtige Wahl warteten, welche durch den Gesetzgeber erfolgen sollte. Zwei Jahre später wurde die Gesetzgebung von Generalmajor Smedley Butler völlig aufgelöst, als das haitianische Parlament sich weigerte, eine von den USA ausgearbeitete Verfassung zu ratifizieren. Ein Vertrag über Haiti wurde erzwungen, durch den das Amt des US-Hochkommissars geschaffen wurde, um das Land zusammen mit seinem handverlesenen “Haitianischen” Präsidenten zu führen. Immer wieder gibt es Proteste gegen die regierungGeneral John H. Russell wurde auf diesen Posten berufen. Die US-Flagge wurde in Haiti gehisst. Die Kontrolle der Finanzen des Landes, öffentliche Arbeiten und öffentliche Gesundheitsdienste wurden an die südlichen US Demokraten übergeben, die Wilson´s Kampagne unterstützt hatten, in der gleichen Weise, wie diese heute an USAID und Nicht-Regierungsorganisationen (NGO) übergeben wurde. Die Idee war damals dieselbe wie heute: Die gesamte Wirtschaft Haitis sollte den USA dienen und nahezu jeder US-Dollar, der in Haiti als Lohn ausgezahlt wurde, sollte in die USA zurückkehren. Seit mehr als drei Jahrzehnten haben die Besatzer von den Haitianern auch Steuern erhoben und das in der Höhe von 40 Prozent des Bruttoinlandsprodukts (BIP). Martelly – Lamothe – ClintonClinton sah in dem Erdbeben von 2010 seine Chance, der neue US-Hochkommissar von Haiti zu werden. Kaum etwas in seinem Ansatz war neu, mit Ausnahme von seiner Einstellung von Lateinamerikanern um sein Projekt zu unterstützen. Argentinien, Brasilien und Chile wurde die Chance geboten, Prestige auf der Weltbühne zu bekommen und eine repressive Macht zu versammeln, abseits von den neugierigen Blicken ihrer Staatsangehörigen, durch die Ausbildung und Modernisierung ihrer Armeen auf dem Rücken der Haitianer als ihre ahnungslosen Opfer. So wurden diese Länder der “ABC” Kern der (De) Stabilisierungsmission der Vereinten Nationen in Haiti (MINUSTAH): die einzige UN “Friedenstruppe” in einem Land, das sich nicht im Krieg befindet. Die MINUSTAH begann ihre Karriere mit dem Töten von Tausenden von Lavalas Partisanen, um so den Volksaufstand gegen den Putsch, der Haitis gewählten Präsidenten Jean Bertrand Aristide entfernte, zu unterdrücken. Friednestruppen der UN brachten die Cholera ins LandDerzeit beteiligen sich auch Bolivien, Kanada, Ecuador, El Salvador, Frankreich, Guatemala, Honduras, Indonesien, Jordanien, Nepal, Paraguay, Peru, Philippinen, die Republik Korea, Sri Lanka, die USA und Uruguay an einer erweiterten MINUSTAH Mission. Nachdem Clintons repressive Armee an Ort und Stelle war, machte er sich daran, Haiti die wirtschaftliche Kontrolle zu entreißen. Binnen vier Monaten nach dem Erdbeben, gründete er die Interimskommission für den Wiederaufbau in Haiti (CIRH): ein strikte Pay-to-Play (wer bezahlt, darf mitspielen)-Gruppe von Beamten / reichen Geschäftsleuten aus den MINUSTAH Ländern und anderen, die sich bereiterklärten, bewaffnetes Personal aus ihrem Land oder Geld (mindestens 100 Mio. $ in einem Zeitraum von zwei Jahren oder die Löschung von mehr als 200 Millionen Dollar Schulden ) beizutragen, im Gegenzug für ein Stück von der Action in Haiti. Bill Clinton – Special Envoy fuer HaitiNach einiger Überredungskunst und Bestechung wurde das haitianische Parlament gezwungen, für 18 Monate den Ausnahmezustand zu erklären, in denen Clinton und seine CIRH Bande tun konnte, was ihnen im Hinblick auf den Wiederaufbau gefiel, ohne Haftungsrisiko. Eineinhalb Jahre vergingen und als der haitianischen Senat feststellte, dass nicht viel vollbracht worden war, wurde der Ausnahmezustand nicht erneuert und die CIRH beschuldigt, angeblich betrügerisch zu sein. Inzwischen hatten Clinton und seine Kumpane angefangen, einen anderen Weg zu suchen, um ihren wirtschaftlichen Würgegriff auf das Land fortzusetzen und dies würde auch einen geeigneten haitianischen Präsidenten beinhalten: insbesondere einen, der bei den jungen Haitianern beliebt sein würde, dem es aber an Patriotismus fehlte. Prostete gegen MINUSTAH und CIRHSie fanden ihren Mann in dem vulgären Musiker Michel Martelly. Seine Wahl wurde eine reine Formsache, nachdem eine Wahlkommission die Fanmi Lavalas Partei, die die Zustimmung von 80 Prozent der Wahlberechtigten hatte, von der Teilnahme ausschloss. Beobachter aus der Caricom und der Organisation Amerikanischer Staaten (OAS) legitimierten die Ergebnisse trotz zahlreicher Unregelmäßigkeiten und Wahlgängen mit nur etwa 20 Prozent der Wahlberechtigten. Das waren die Bedingungen, unter denen Michel Martelly der (aus) gewählte Präsident von Haiti wurde. Ein alltäglicher Anblick – Blauhelme in den Strassen von HaitiGleichzeitig mit dem Aufbau des neuen Parlaments im Frühjahr 2011, versuchte Clinton, Haiti eine Reihe von Verfassungsänderungen aufzudrängen, von denen fast alle das Ziel hatten, die Regierung zu zentralisieren, so dass das Land leichter über ihre Exekutive kontrolliert werden kann. Insbesondere der haitianische Oberste Gerichtshof, in der Regel bestellt mit der Eingabe der Gemeindeversammlungen, wäre durch einen Verfassungsrat von Beauftragten von Martelly ersetzt werden. Auch alle örtlichen Richter, Bürgermeister, und Gouverneure der Departements würden auch durch Martelly Beauftragte ersetzt werden. Schließlich möchte der Präsident die Möglichkeit haben, in aufeinanderfolgenden Amtszeiten zu dienen, anstatt auf nicht-aufeinanderfolgende von fünf Jahren begrenzt zu sein. UN Friedenstruppen beherrschen das Bild in HaitiNachdem das Parlament sich weigerte diese Änderungen zu ratifizieren, war es nicht aufgelöst. Solche Dinge werden in dieser Zeit des humanitären Imperialismus nicht mehr durchgeführt. Die Verfassungsänderungen wurden einfach per Dekret des Präsidenten über das Land verhängt und das Parlament schwand, aufgrund einer Vernachlässigung Parlamentswahlen zu halten. 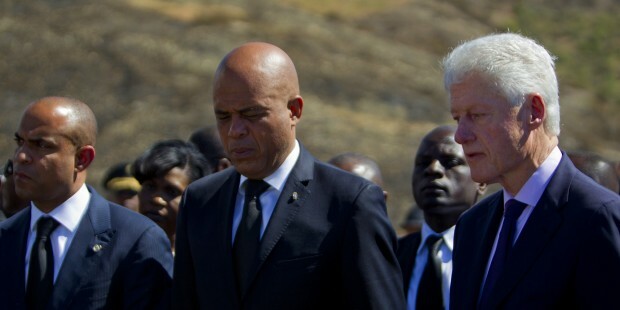 Clinton wählte Laurent Lamothe als Haitis Premierminister. Er musste nicht lange suchen: Lamothe war ein reicher Geschäftsmann und CIRH Mitglied. Haiti ist keine Ausnahme darin, Männer wie Martelly oder Lamothe zu haben, die einem Besatzer eifrig als Vichy-Administration dienen würden. Es ist kaum verwunderlich, dass die erste Treue dieser Personen, jene zu Geld ist. Kurz nach der Installierung des Martelly-Lamothe Regimes, wurde damit begonnen die Stromnetz- und fließendes Wasser Dienstleistungen in den großen Städten Haitis zu demontierten. Anti-Regierungsproteste in HaitiDies hatte zur Folge, dass die Grundstückspreise in den von Regierungsbeamten begehrten Bereichen gedrückt wurden, darüber hinaus schuf es Gründe, Hilfsgelder zu erbitten. Schlimmer noch, Martelly´s ernannte Mitglieder – einige mit Vorstrafen – begannen zu plündern und sogar Haitis Rathäuser und lokale Gerichte zu zerstören. der verdächtigte Tod eines Richters, der Ermittlungen in einem Fall der Usurpation und Geldwäsche gegen die Frau und den Sohn des Präsidenten durchgeführt hatte. Es gab nie eine Untersuchung; die Kläger in diesem Fall, Enold und Josue Florestal, wurden seit August 2013 inhaftiert, etwas, was man in der Regel als politisch motivierte Verhaftungen betrachten kann. 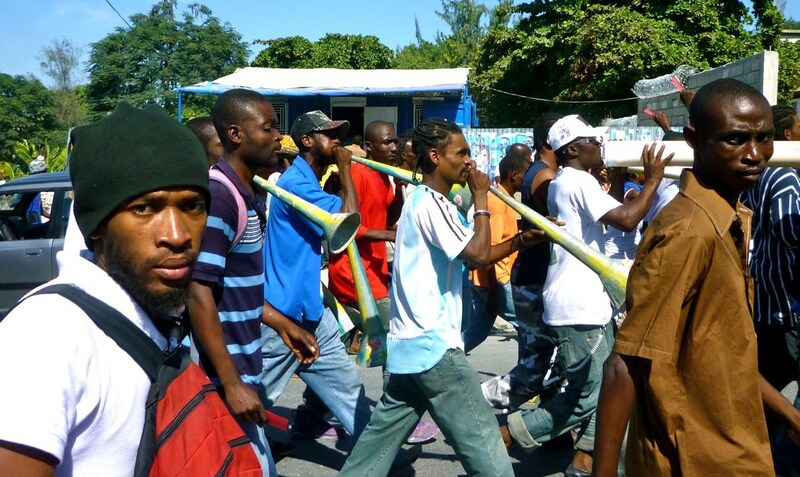 UN Friedenstruppen beherrschen das Bild in HaitiProteste in ganz Haiti sind entbrannt. In einigen Gemeinden, wie Petit Goave und Port-au-Prince haben über 20 Tage lang Aktionen stattgefunden, um ihre Empörung über das inkompetente und korrupte Besatzungsregime zum Ausdruck zu bringen. Trotz öffentlicher Unterstützung von Bill Clinton, war sein Schützling Laurent Lamothe gezwungen, sein Amt als Ministerpräsident am 13. Dezember 2014 zurückzulegen. Michel Martelly, der ebenfalls von Bill und Hillary Clinton unterstützt wird, wird wahrscheinlich den gleichen Weg gehen. Die internationale Gemeinschaft, die sich damit begnügt hatte, Haiti in seinem schlimmsten Moment zu parasitieren, begann vor kurzem zu rufen, dass das Land in eine Krise gehe, da das Scheitern Wahlen abzuhalten, zur Auflösung des Parlaments am zweiten Montag im Januar 2015 führen wird. Zufälligerweise wird Montag, der 12. Januar 2015 auch der fünfte Jahrestag des Erdbebens sein: ein Tag für Inventur, das ist sicher. Clintons dürftige Leistungen im Wiederaufbau werden nicht gut abschneiden. Alltag in Haiti – die Bevoelkerung spuert kaum etwas von den versprochenen VerbesserungenHaiti geht nicht in eine Krise, es entsteht aus einer. Wenn die internationale Gemeinschaft legitime Geschäfte mit Haiti führen möchte, dann müssen zuerst Clintons Schäden repariert werden. Wahlen müssen zum frühestmöglichen Zeitpunkt für alle lokalen Behörden (Bürgermeister, Richter), die Legislative und für einen neuen Präsidenten stattfinden. Ein Ministerpräsident muss ernannt werden und ein oberstes Gericht muss eingesetzt werden. Im Hinblick auf Haiti kommen die Ausdrücke “Verfassungskrise” und “politisches Chaos” von der internationalen Gemeinschaft, in der Regel schon Drohungen gleich, Haiti zu einem gescheiterten Staat zu erklären und die Regierungsführung durch die UNO oder die Zwangsverwaltung durch die USA vorzuschlagen. UN Friedenstruppen beherrschen das Bild in HaitiSolche Drohungen, sind kaum jemandes Beachtung wert. Es ist sehr unklug von den Vereinten Nationen und den USA anzunehmen dass sie besser wären in einem Versuch, Haiti mit Gewalt nehmen, als Napoleon. Es gibt keine andere Wahl für die Clintons, als Haiti zusammen mit ihren internationalen Kohorten von Parasiten, einschließlich der MINUSTAH, den NGOs und USAID, zu verlassen. 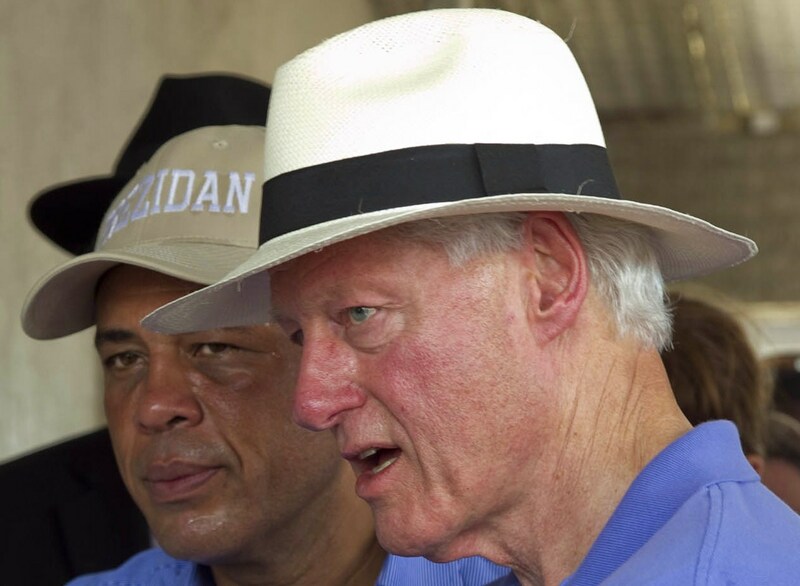 Wenn Bill Clinton seinen reichen Freunden, Teile von Haiti feilgeboten hat, die ihm nie gehörten, dann lasse man das sein persönliche Dilemma sein. Eine Reihe von Klagen, wegen Unterschlagung, Korruption und Geldwäsche wurden bereits gegen Martelly´s Familie und Lamothe eingereicht; Clinton könnte sich auch im selben Netz verfangen. Verträge, abgeschlossen während der Zeit der außer Kontrolle geratenen Diebstähle von der Clinton ernannten Martelly-Lamothe Regierung, verdienen nicht mehr Respekt, als der Erwerb einer gestohlenen Uhr an einer Straßenecke. Haiti ist nicht zu verkaufen – weder als Ganzes, noch in einzelnen Teilen. Mit freundlicher Genehmigung von Dady Chery | Dady Chery ist Herausgeberin von Haiti Chery und Co-Chefredakteurin von News Junkie Post. Chery ist eine in Haiti geborene Journalistin, Dramatikerin, Essayistin und Poetin, die in Englisch, Französisch und ihre Muttersprache Kreolisch schreibt. Sie schreibt ausführlich über Haiti und weltpolitische Fragen wie den Klimawandel. Ihre vielen Beiträge zu haitianischen Nachrichten enthielten den ersten Gedanken, dass Haitis Cholera von den Vereinten Nationen ins Land gebracht wurde und die erste Beschreibung von Haitis Bodenschätzen. Dady Chery hält ein Doktorat. I suggest the author run for president of Haiti. Her first act upon being elected should be to kick out all NGO’s and block all financial transactions that originate in the states or France. I wish you luck. My views on NGOs, especially religious ones like yours that presume to bring their superior culture to Haiti, are well known. Along the same lines: if I should run for office in Haiti, it would be on my own advice and with the counsel of my chosen advisors. Marvelous! Beautiful. But you forget the misdeeds of Bellerive, Latortue and Gousse. Yet good job. Thank you, L Harri. For the sake of brevity, I decided to focus on the post-earthquake period. Bellerive and the others will have to wait for another article. Heart-wrenching report. Thank you Dady. You are welcome, Frank. Thank you for spreading the word. Mwen renmen anpil dokiman sa-a ou poste sou intènèt la-a. Onsèl ti bagay mwen ta renmen di. Mwen konnen Haiti se yon peyi ki pòv anpil, sa ki fè nou nan sitiyasyion nou ye jodi ya se paske nou pa gen yen edikasyion, twòp moun pa konn li ak ekri, lòt peyi pran avantaj inyorans nou. Nou tèlman pòv nou nan nesesite, depi yon moun sot kote li soti li ofri senk kòb, lòt la ki te deja pa genyen, li pran l pou l ka al fè dezòd yo mande l pou l al fè. Mwen dakò pou Ayisyen revandike, pou yo choute bouda moun ki vle okipe peyi ya. Men antretan se pou nou sispann kraze sa nou deja genyen ki kanpe, se pou nou sispann touye yonn ak lòt. Gouvènman yo pa bon se vre a kòz de kòripsyion, men chak fwa nou kraze yon bagay peyi ya fè plis bak paske nou pa genyen mwayen pou nou ranje-l jan li te ye ya. Nou dwe sispann kache pèp la verite sou sa ka-p pase, tout bagay se sekrè. Si te genyen lòt moun menm jan avèk ou, lè yo konnen verite ya yo tap mete l deyò pou tout moun li e konnen sa ka p pase, mwen kwè ta genyen yon ti limyè, yo ta jennen fè peyi ya mal. Depi Ayisyen wè blan, yo konnen de bon dye. Mwen ta swete lòt moun wè atik la a, yo li l, yo konprann li, e je yo klè. Mèsi anpil Loulou. M pral fè oun tradiksyon an franse, e pyi tou, m ankouraje tout moun ki kapab pou yo pote infomasyon sa yo na radyo an kreyòl, pou pèp ayisyen kapab konnen l.
MINUSTAH and the structures that support it must go, I have said a hundred times before. I also wrote about the farcical elections in Haiti, over which Hillary Clinton presided with explicit threats of revocations of visas of Haiti’s servile and corrupt political agents. To the enduring chagrin of all who have a historically rooted sense of Haiti’s place in the world, the country’s sovereignty has been parceled out and sold to the highest bidders (and particularly so, under the imposed Boniface-Latortue/Gousse regime). However, we still have much difficulty envisioning a solution to Haiti’s ills short of a full-blown revolution and I am not thinking of a bloody one controlled by special interests, but one rooted, impossibly as it may appear, on True Love and sense of Purpose and Destiny. At this point in time, we are far from having the correct mindset to counter effectively the special interests that keep us under occupation. When Haitian elites will finally comprehend the futility of “diners blancs” and “carnavals de fleurs” and other such vanities in the midst of the increasing despair of the populace and the lack of urgency with respect to restoring our crumbling environment, then and only then will we be able to educate each other and join hands in the reconstruction of our country, locals and diaspora alike, irrespective of the puppet governments which they will continue to put in place in the foreseeable future. I agree by and large with the expose until I read this : “Elections must be held at the earliest possible date for all local officials (mayors, judges), the legislature, and a new president.” It leaves me puzzled. The questions that occur to me are these : A new president, really? Under the guise of what legal cover? Wouldn’t it better to seek to pressure him and control his actions rather than replace him at once and all that truly implies? Do we have the money to finance and run our own elections or will they be once again financed by France, Canada and the U.S., while we expect them miraculously to not try to exert influence in seeking to impose their own agenda? Note that it is not my wish to express opposition to the idea of having a completely new and remodeled government run by Haitians for national interests. However, at this point, I am seriously disillusioned by the successive presidential and legislative elections in our homeland, and I am left to wonder when Haitians will finally reclaim their sovereignty and revolutionary ideals which have been so trivialized time and time again. Yes. We must continue our revolution with “True Love”, as you write, and a sense of “Purpose and Destiny.” As I’ve noted before, one cannot expect to be left alone after doing something as audacious as taking a piece of land because one has slaved for it. As for the elections: Haiti urgently needs local and legislative elections, and these should be given priority. The rest (President, Prime Minister) could probably wait. I agree that we cannot expect free and fair elections that are funded by the UN (= US, France, Canada). Elections are not so expensive and really do not require much more than a group of honest people who can count. Certainly, money and technology are no guarantee of a correct count. Apart for some bribe money, for example, it did not take a whole lot of technological know how to steal the last presidential election by excluding the Fanmi Lavalas Party. Peterson, Mondy: Thank you for your kind words and for your work spreading this information. One of the best article on Haiti I’ve read in a while. Good job, Dady. I am possessed by a spiritual force which I cannot resist. Live long and prosper. Dady, I command you on this fantastic article. Everything is well written. This will help Haitian-Americans understand what’s going on in the island of Haiti. Once again, congratulations! And first and foremost, keep it up. Do what your instinct tells you to do. Overall, use your charisma, your patriotism. As you said, this is because of our high percentage of illiteracy. But again this is the way they!!! wanted it. Illiteracy goes together with poverty. Again mwen wete chapo devan ou. Thank you for the kudos Wilson and Enide. 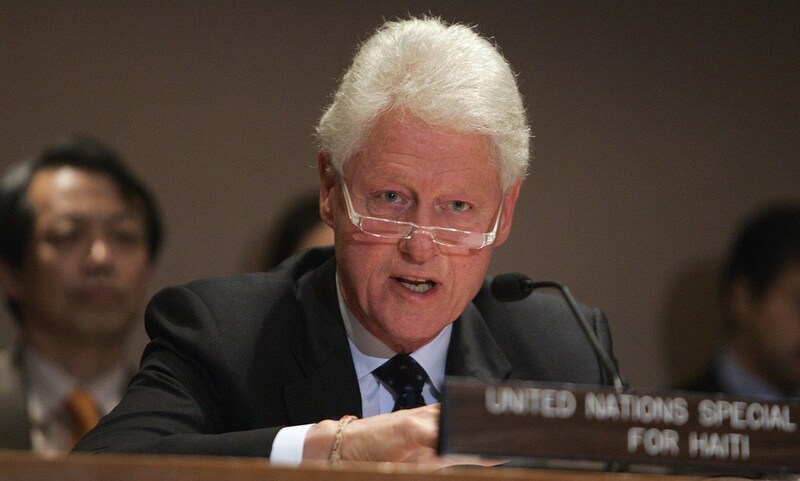 I agree with you that the Martelly-Lamothe regime is corrupt and controlled by Bill Clinton. But you forgot to say why we have them. Do you know how many presidents we have ousted out From Baby doc to Aristide? Will the situation of Haitian people ever change? We all know that the politicians of Haiti care only about money. They don’t care about the country. They don’t care if all the schools are closed because their kids are not living in Haiti. We would never have Bill Clinton or Martelly if our politicians cared about this country or the people. Since 90% of the people are unemployed, they use them for $50 US to boule kaochou et bagay ki fet deja. Menm moun sa yo kap mande pou Matelly ale, se menm moun sa yo ki tap mande pou aristid ale et ki te suporte Matelly. It is time for us to realize that an ousted president is not the solution. It never worked and it will never work. One good thing we did in our history is we fought for our independence. Do you know how we did it? We came together and we fought and won. Since then, we’re divided and we always have a mediator between us. I have one question, can we come together again and have one good solution for this country? Hi Rosevel, I understand why you feel the way you do, but I tend to see things more positively than this. Clinton has had his fingers in Haiti since he brought Aristide back in 1994. The names of the Presidents and Prime Ministers change. That’s all. Many Haitian politicians do care, but the great majority of those who do are not in the central government but in local governments. They are the mayors, judges, local governors in towns and departments all over Haiti. They’ve been put through hell by this occupation. They’ve received death threats. At least one mayor has been beaten and imprisoned for defending a group of peasants against a rich family that wanted to take away some common lands. Many Haitian senators and MPs have fought tooth and nail to prevent Clinton from selling the country to his friends. This is exactly why these Haitian politicians have been removed from office by decree or by not holding elections. Our independence is probably the most audacious act in human history. Like you write, it took all of us fighting together to win this. We do have our differences, including the rift between our elite of mostly mulattoes and the 99 percent who are poorer and darker. 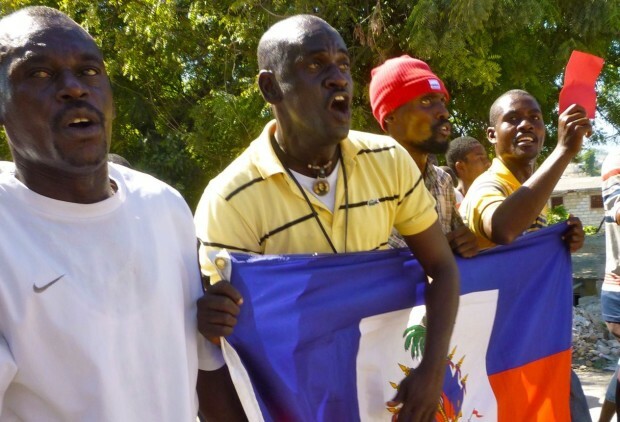 Even so, compared to other countries like Rwanda or Nigeria, for example, that have ethnic/religious differences that can be exploited by the occupier to start civil wars, we Haitians are remarkably united. I wish one day the country will find an honest person to win the Haitian presidential election, a person who will say no to bribery, a person who will see the country but not his pockets, a person who will help decrease the percentage of the country’s illiteracy, and this way the country will eventually come out of poverty. It is absurd to say that we do not need other countries’ help, but if the help is poisoned we need to have the knowledge of this and the strength, the courage, the resilience to say NO. I am not an expert, I do not know anything about elections but like Dady Chery said, “we just need honest people who know how to count”. Stop the intimidation, do a lot of motivation, school the people on how it is important to have an election and respect each other. We do not have to beat or kill one another just because our opinions are different. It hurts me to see that my countrymen are always at war among themselves just because we do not value our existence, the life of one another. Other countries talk about how resilient we are, when in fact we aren’t really, because we’re so quick to accept anything, -anything- from a coward (a manipulator in disguise) to go do anything stupidly reckless without foreseeing the shameful result. Encore une fois Dady Chery, je te dis mille merci pour cet article, je le trouve superbe. You are welcome, Loulou. Thank you for your kind words. I agree with you that we should be able to find someone to serve as president who is honest, strong and ambitious for the country. Another Dumarsais Estime, for example, would work. There are so many good people in Haiti! Thank you so much for your detailed accounts on what really happens in Haiti. We have received no news about the recent protests nor the resignation of Lamothe. You are our only source of information. Keep up the good work. I wait for the day when Haiti is free of the leeches who call themselves its ‘saviors’. You are welcome, Tom. Glad to be of service. This person actually calls herself a journalist? Please do all journalist a favor and don’t call yourself one. This article was so bias it almost made me puke. People if you really want quality news the BBC news is unbiased unlike this load I just read. I too find the word “journalist” to be unpalatable. Unlike mainstream journalists, I do not make any pretense of being unbiased, nor do I parrot anything reported by AP (American Propaganda) without verification, or take dictation from the US State Department, or consider every word uttered by government officials, including clear attempts to defame their political opponents (like, for example Laurent Lamothe’s widely reported assertions that those who opposed his usurpation of Haiti’s offshore island Ile a Vache are drug dealers), to be newsworthy. I am quite unimpressed by mainstream media journalists who have contacted me because of my expertise on Haiti. For the most part, they cannot find their way out of a paper bag. I will enthusiastically adopt a different title if one can be found. Dady, thanks for your lucid and uncompromising writing. The people of Haiti are truly an inspiration in the strength and courage they display every day not only surviving but fighting for the kind of nation they envisage. Being a Swiss citizen, I’m really interested to know more about this Swiss company that collects taxes in Haiti. It wouldn’t be SGS, would it? I appreciate your writing. And I agree that it is really bitter to see left-wing Latin-American governments being part of Minustah, though I definitely would not equate them with their right-wing “collegues”. Thank you for your kind words. Yes, it is SGS. Left-wing Latin-American governments like Ecuador, Argentina, Bolivia, and Uruguay, are actually far more damaging because they give a veneer of legitimacy to what is actually a brutal foreign occupation project. There is not a single criterion by which one could argue that Haiti has become more “stable” since the insertion of this supposed “stabilization” force. Crime has increased and, as of January 12, 2015, Haiti became a full dictatorship without an elected parliament, judiciary, local mayors, etc. The oppressed Latin American citizens of these supposed left-wing governments understand that their governments are not what they pretend to be. The propaganda from these countries seems to be especially directed at left-leaning Europeans, Americans,… and of course, Australians. Pity Julian Assange. 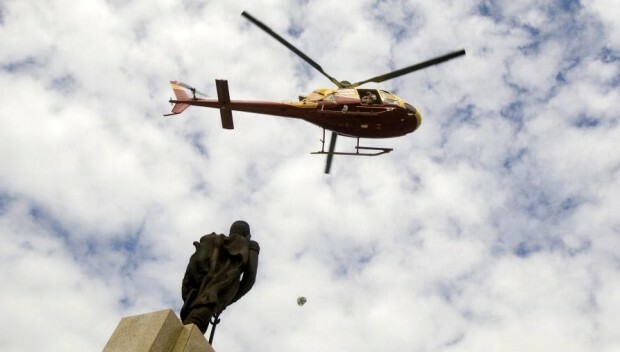 Ecuador has essentially been under control of its army since Fall 2010.